When I was a kid, field trips meant one thing: no school. We didn’t have to sit at our desks, and we got a chance to expand on our classroom learning out in the world. Now that I’m a teacher, I realize how much planning goes into taking a class out of the building. So in today’s post, I’m going to share 5 reasons field trips stress me out and 5 reasons it’s totally worth it! Our first field trip of the 2016-2017 school year! Omg. It takes so much planning to organize a field trip. There’s so many ducks that I have to get in a row before I can take my class out of the school. After I pick the destination and set our date, I need to get approval from the school management, notify parents, send out permission slips, and collect any money. I also have to visit the place beforehand, so I can plan out the easiest route to walk around and scout locations for snack and lunch (which we’ll get to later). Eeesh. The school that I work at doesn’t charter buses for field trips. That means that if I want to go somewhere, I need to get there via public transportation. That’s not so bad with older children, but I teach preschool. So that means I have 16 students (who are 4-5 years old) that I need to somehow squeeze on the bus or metro. My assistant teacher and I are thankfully pretty coordinated, so we are able to get all 16 on and off the buses without losing anyone. But it’s still incredibly stressful. If I’m planning on being out for the whole day, I have to feed my class on the go. This means that I have to be able to lay out a tarp, so everyone can sit and eat picnic-style. This also means that my little guys need to carry their snacks, lunches, and water bottles themselves. That’s a lot for little humans to carry, and they get tired very quickly. This leads to lots of complaining, and excessive complaining can slow down the whole trip. That’s when the planning comes in handy. Usually I’m prepared for snack and lunch just about the time the complaining is about the start. One of the hardest parts of a field trip day is getting children back to school on time when they’re tired. I always make sure to allow extra time to make up for the fact that most of my kids will be dragging their feet out of sheer exhaustion. This extra time is important because missing a bus because the kids were too tired to walk quickly is the easiest way to get my stress level through the roof. Again, my kids are preschoolers. They need to go to the toilet a lot, and they usually only let you know they need to pee about a minute before it’s too late. This requires me to constantly remind them to go the bathroom when they have a chance. Everyone has to go before we leave school and before we go back: no ifs, ands, or buts. I also make sure snack and lunch is near a bathroom, so I can shuffle them all in and out over the course of a half hour. Even though it’s never happened, I’m always terrified that one of my kids is going to have an accident in the middle of a field trip. Our first field trip of the school year was last Friday. 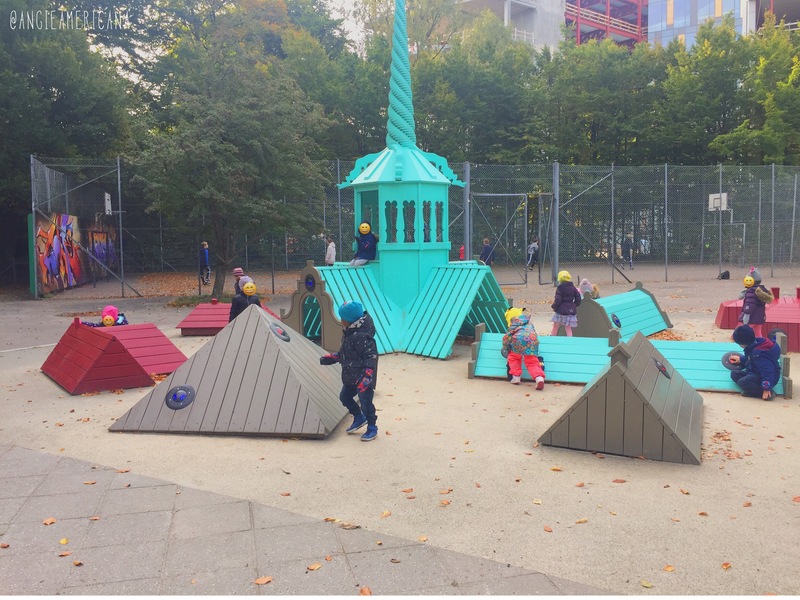 We went to a playground at a park in Copenhagen. This wasn’t a learning field trip, but it was definitely necessary. It was the day after our first unit ended, and my kids were restless after working so hard since August. They really needed to get out of the classroom for a full morning to scream, yell, climb, jump, slide, and get the wiggles out of their system. One of the main reasons I love field trips is because it really helps students learn basic safety skills. These are things that you can’t really teach in the classroom. It’s only outside of school that they can learn how to walk on the sidewalk and cross the street safely. For a lot of my students, this is the first time that they’ve ever been in a school. Most of them are used to only going places with their parents or families. Even though they are 4 and 5, they are sometimes still treated as babies at home (fx. I have kids that are carried by their parents to school or have parents that carry their backpacks for them). That does not fly in my classroom. My students learn to take care of themselves and do things on their own. By going on a field trip, they are required to walk on their own and carry their own backpacks. Most of them go on to tell their parents that they no longer need help because they can do it on their own. Last year, we had a whole unit on animals, so naturally we went to the zoo! It was great to see my students make connections between our classroom lessons and their observations at the zoo. Sometimes it can be difficult to get discussions rolling when you’re sitting on a rug, but a field trip is a great opportunity to get your kids to really explore what they’ve already been learning. Some of the best memories that I have with my classes are from field trips. On the way to the park last Friday, we shared a bus with the Kindergarteners (my class from last year). I overheard them saying things like “The last time we were on the bus for school, we went to see the lions” and “It was so fun when we got to feed the goats”. It just goes to show that field trips really stick out in the children’s minds as not only great learning experiences…but great memories. I managed to survive my first trip of the year, but I know that I have at least 4 more that I need to plan. Field trips will always stress me out as much as any other teacher, but I just have to keep reminding myself that it’s always worth it in the end.